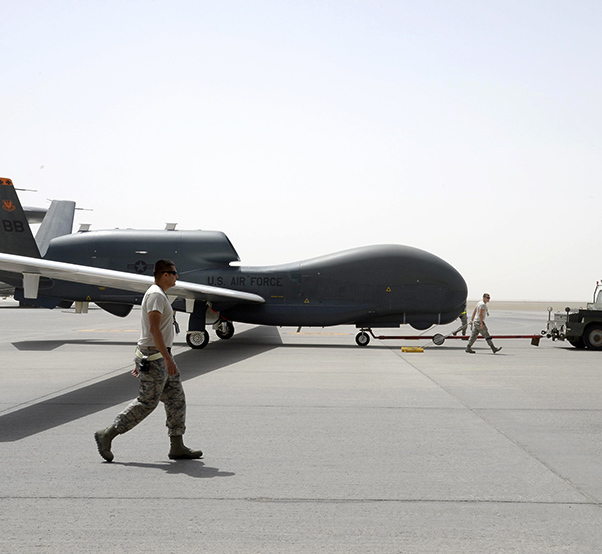 Airmen from Hawk Aircraft Maintenance Unit welcome an RQ-4 Global Hawk aircraft at an undisclosed location in Southwest Asia March 8, 2015. Block 20s were initially fielded with imagery intelligence (IMINT)-only capabilities. Three Block 20s have been converted to an EQ-4 communication relay configuration, carrying the Battlefield Airborne Communication Node, or BACN, payload. 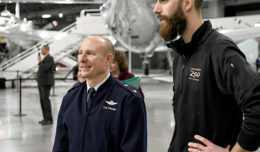 The Battlefield Airborne Communications Node program based at Hanscom Air Force Base, Mass.,, commonly referred to as BACN, recently awarded Northrop Grumman a contract extension valued at more than $120 million, securing the system’s future for months to come. The payload operations and sustainment extension will allow four BACN-equipped E-11As and three unmanned EQ-4Bs to continue providing reliable situational awareness and battlefield communication to warfighters — at least until June 2016. However, the Air Force plans to execute a second extension lengthening BACN’s lifespan until January 2017. 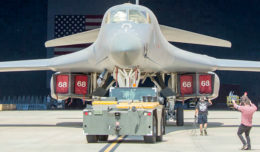 The BACN system gives warfighters the ability to exchange information between disparate tactical datalink systems, utilize voice relay, bridge between different voice systems and share data via an airborne server; it is an Air Force asset that is employed 24/7 and used by air, ground and sea military units. Born out of a need to connect service members using incompatible communication systems across long distances and in austere environments, BACN was designated as a Joint Urgent Operational Need in May 2009. The original BACN contract was awarded to Northrop Grumman the same year and expired in June 2015; the total value of the contract during that period was in excess of $1.2 billion. But BACN has proved to be a valuable operational asset. In November 2013, BACN surpassed the 5,000 combat mission mark and is now well on its way to hitting a 100,000 flying hours milestone in the coming months. In an effort to plan for the future, the program office is scheduled to meet with the program executive officer next week to determine an acquisition strategy moving forward past the second extension. Whatever strategy is agreed upon, for now, the Air Force clearly intends to keep BACN in the fight.